Description: The museum at this state park houses one of the largest collections of Ancestral Puebloan (Anasazi) pottery in the Four Corners Area. Outside the museum there is a ruin of a 1000 year old kiva that you can climb down inside. Location: 660 West 400 North Blanding, Utah. Blanding is located about 300 miles from Salt Lake City. Cost: $5.00 for adults, $3 for seniors and children, free for children ages 5 and under. Operating Seasons and Hours: 9:00 am to 5:00 pm Monday through Saturday. 10:00 to 4:00 on Sundays. Open every day of the year except Thanksgiving, Christmas Day, and New Years Day. This was the third stop on the fifth day of the Southern Utah Road trip that my husband and I went on in May of 2010. 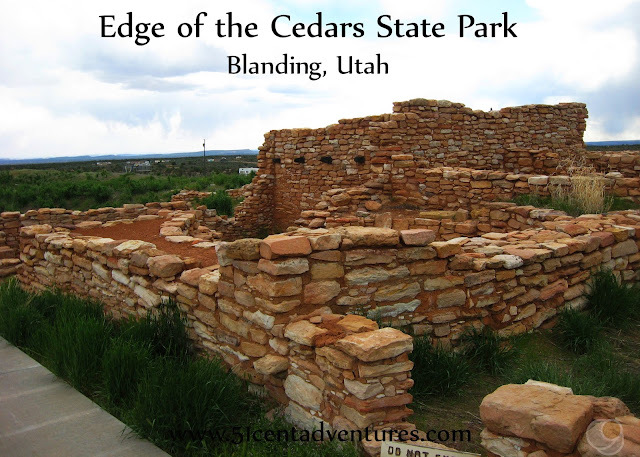 We left Natural Bridges National Monument and drove and east along Highway 95 for an hour to the town of Blanding, Utah. Edge of the Cedar's State Park was never on my "must see" list. In fact I didn't know it existed until I started planning this road trip. And even then it only got added to the itinerary because it wasn't that far off our our route. We had to travel through Blanding and the museum was only a few blocks away from Highway 191. My thought process basically went like this, "oh there is a state park in Blanding. Well we might as well go stretch our legs there." I expected to find a dinky state park in the middle of a dinky, rural Southern Utah town. I ended up wrong on both counts. I always assumed that there was nothing in Blanding, Utah. I pictured it as a farming community on the edge of civilization. I thought that no one would ever bother driving 5 hours to go there. What I didn't realize is that Blanding is Utah's largest city in the Four Corners Region. 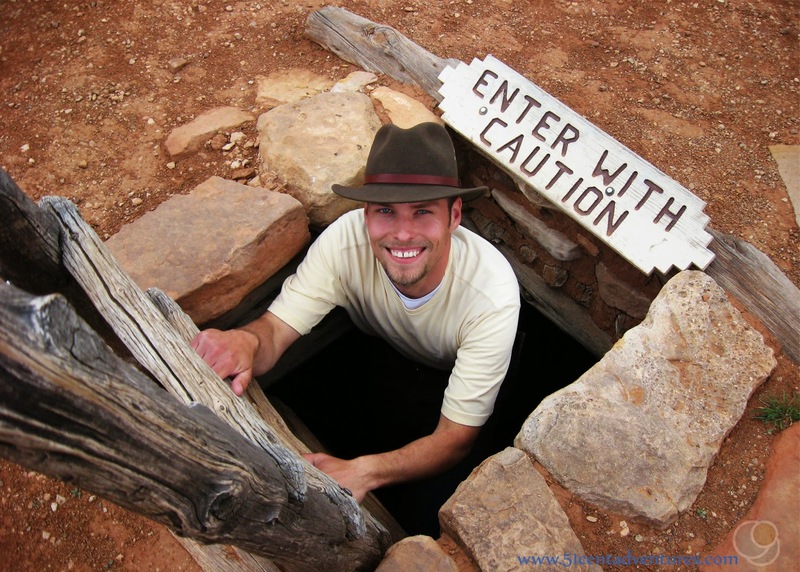 It's a hot spot for people that are interested in visiting Native American ruins and seeing Southeastern Utah scenery. Blanding is even billed as a "Base Camp to Adventure." We passed many hotels and restaurants as we drove through town. Compared to the remote locations we'd driven through during the past few days this city seemed like a bustling metropolis. The city even had a traffic light or two. Signs guided us to the Edge of the Cedars State Park and Museum located on the outskirts of the west side of town. We went inside and flashed our State Park Pass to gain admittance. Then we started wandering around the museum. I didn't take any pictures- I can't remember if that was because I wasn't allowed to, or because I just didn't think to. However, I do remember that I loved the inside of the museum. The museum has one of the largest collections of Ancestral Puebloan pottery in the Four Corners Region. But that's not what interested me. I was impressed by how the artifacts were displayed. This wasn't a sterile feeling museum with white walls, florescent lighting, and display cases full of artifacts. Instead it felt more like an art museum. The walls were a darker color. The ceiling had wooden beams supporting it. The artifacts were displayed in cases alongside similar items. There was enough space between artifacts to give you a chance to really see each object as an individual peace and not as part of a conglomerate. The way everything was displayed created a relaxing atmosphere. Instead of quickly glancing around at everything like I would normally do, I slowed down and really looked at the artifacts. I read the descriptions of what the artifacts were used for. I thought we would spend about 15 minutes inside the museum, instead instead my husband and I stayed for at least an hour. My favorite part of the museum actually had the fewest artifacts. It was a display entitled "Discovery!" It houses artifacts that regular people discovered while they were out exploring. Rather than keeping what they found (which is illegal) they reported their finds. The artifacts are now on display for everyone to enjoy. When we were done with the museum we went outside to see the ruins of a village. This sight was built over 1000 years ago and abandoned about 800 years ago. The area was excavated in the 1960's and 1970s. The museum had been great, but this ruin was what really made this state park special. My husband and I had visited Anasazi State Park in Boulder, Utah only the day before. That park had ruins of the foundation of a Ancestral Puebloan site. We could view those ruins from a sidewalk that ran around them. There was also a replica of the ruins that you could go inside. We were impressed by that, but Edge of the Cedars State Park was even better. We were very excited when we saw that we could actually go inside the Great Kiva at this site. There's nothing like actually being able to go inside a historical structure to really give you an idea of what life must have been like for ancient people. In addition to the ruins there are many sculptures outside the museum. These were done by Joe Pachak, and artist from Bluff, Utah. 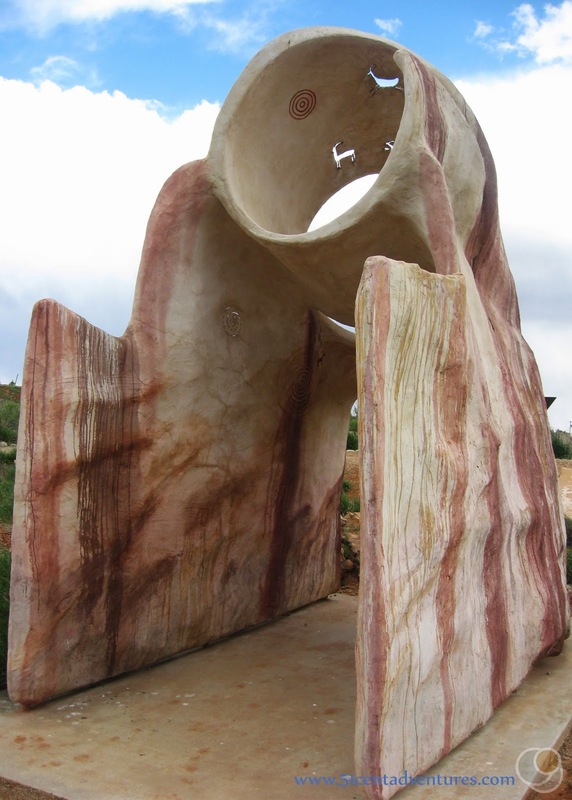 The sculptures depict rock art that is found in Southern Utah. This Solar Marker was our favorite. It helps mark the winter and summer solstices and equinoxes. One of my favorite things about our road trip vacations is the chance to discover new places. I love when I visit a place that I'd barely even heard of and end up falling in love with it. That was definitely the case with Edge of the Cedars State Park. Recommendation: If you are going to be anywhere near the Four Corners Region you should make time to stop at this museum. Directions: Blanding is located along Highway 191 in Southeastern Utah. It is an hour and 15 minutes from Moab, Utah. Once you are in town there are several routes to reach the state park. The most direct way is to travel east on Center Street until you reach 600 West. Then turn right and travel north until you reach 400 North. You'll see the museum and parking lot. 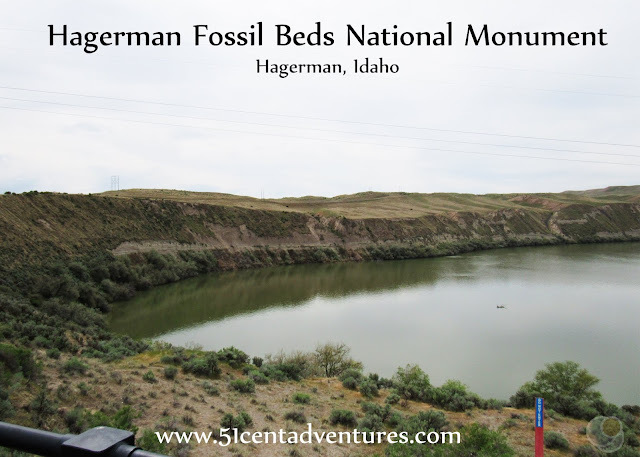 Places nearby: If we'd had an extra day on our trip I would have planned a little detour deeper into the Four Corners Area. I would have liked to see the actual Four Corners site where Utah, Colorado, Arizona, and New Mexico meet. 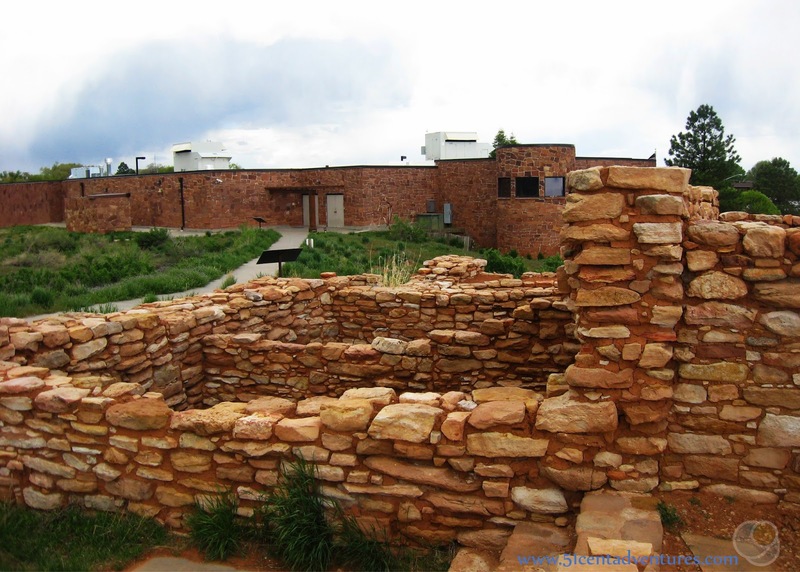 I also would have liked to visit the ruins at Hovenweep National Monument. I really wanted to visit Mesa Verde National Park, but since that is located in Colorado I decided to save it for a future trip. I still haven't seen Mesa Verde, and it is getting to be a little bit of a unicorn for me. We travel past that area on our route between Texas and Utah, but for various reasons we've never been able to go see the ruins. I'm toying with the idea of going on a "Native American Ruins" themed road trip next time we travel to Utah. 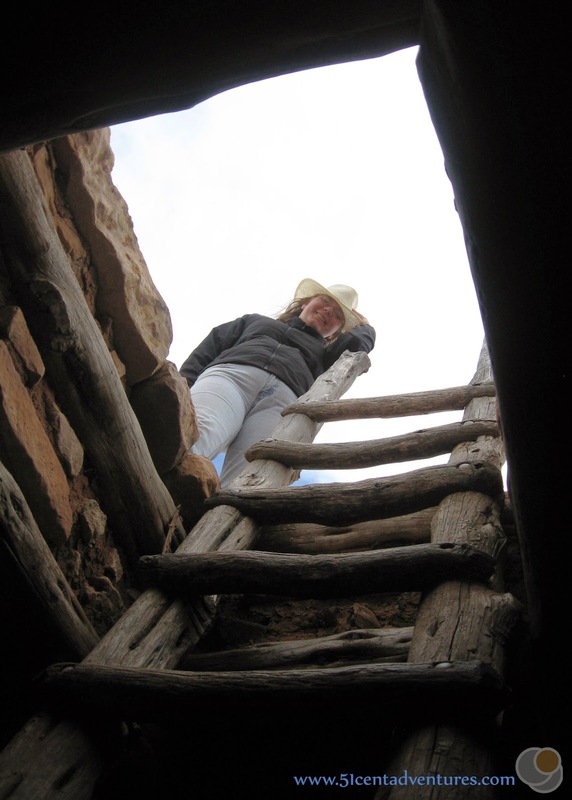 We'll visit Hovenweep and Mesa Verde along with several sites in New Mexico.